This is an interview with Ehome.820, a player of the Chinese DotA team. Hi, 820, thanks for accepting our interview, lets say hello to everyone and make a brief introduction of yourself please. - Hello everyone I am 820 from EHOME, thanks for the interview. So you are in EHOME for more than a month now, are you familiar with EHOME? - I think so, but I am not adapted to Bejing's weather yet. What is your reason to join EHOME? - To be the World Champion. Why insist in bringing 357 along from CaNt to EHOME? - I knew him long time ago and I know that he has great potential. DotA is a team game, how you fit yourself in the new team? - Besides training, I communicate more with my teammates and try to understand what they want. EHOME lost to Ks in recent PD#11 game, is it because of the lag and delay? - No, the connection is fine. We lost because we lack teamwork, and we were doing our own stuff and not playing as a team in that game. Why forfeiting games so often. especially in F4F? - The main problem is the internet, even in 4am midnight there is a 0.5+ seconds delay. How did your team train for MGC LAN? - We are trying to improve our teamplay. Did you guys prepared any new strategy to use againts strong oponent? - Nope, just play like normal. What do you think about strong teams like Fnatic, Ks.int and CaNt? - All of them are strong teams and shouldn't be underestimated. So Sk, MYM and DTS will not be attending MGC08, do you feel unfortunate? - Ya of course, I want to play againts foreign teams. - Ks.int and Fnatic I think, It's boring to play againts same local teams. I will just do my best. 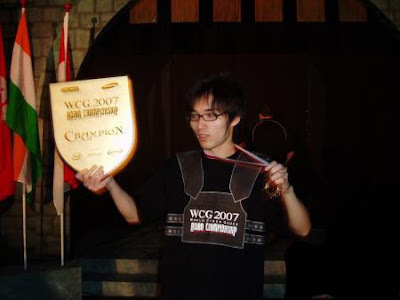 Do you think EHOME can win MGC08? If you get the prize money what will you do with it? - Of course we can win, I will save the money. Do you agree that MGC is actually a gathering for DotA players? - I agree, basically every strong team in China is here. What do you think about MGC? When are you going to Wuhan? What do you plan to do on train? - Sleep, and maybe communicate with my teammates. EHOME members love to play cards, will you join your mates? - Nope, I am not a fan of card games, I'd rather read some novels.